Kitchens are often referred to as the heart of the home. It’s a space where family and friends gather to spend time, socialize, and prepare delicious food! If your kitchen isn’t functional you’ll figure it out pretty quickly! Whether you lack storage space, have an impractical layout, or simply have an outdated kitchen, Refine Renovations can work with you to create a kitchen that your family and friends will love! 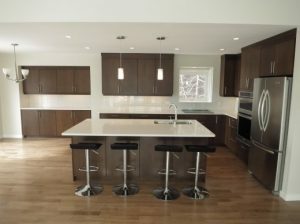 The quality and craftsmanship of Refine Renovations’ work truly shines when we do kitchen renovations. Our in-house team of expert tradespeople will work hard to ensure you get the kitchen of your dreams. Every renovations project is supervised by a skilled civil engineer, providing you peace of mind knowing that the job will be done right. Our custom cabinet shop allows you to pick cabinets that suit both your storage needs and your personal style. Choose from assorted materials, hardware, and finishes to create cabinets and mouldings that are truly unique to your home! Our relationships with Edmonton’s top suppliers ensures that you have access to the best selection of lighting, countertops, and fixtures that will make your kitchen shine. Don’t spend any more time cooking in a kitchen that doesn’t work for you. Contact Refine Renovations today and find out how we can elevate your home’s kitchen!